Uncategorized | Wait…So That's What Catholics Believe?!?! 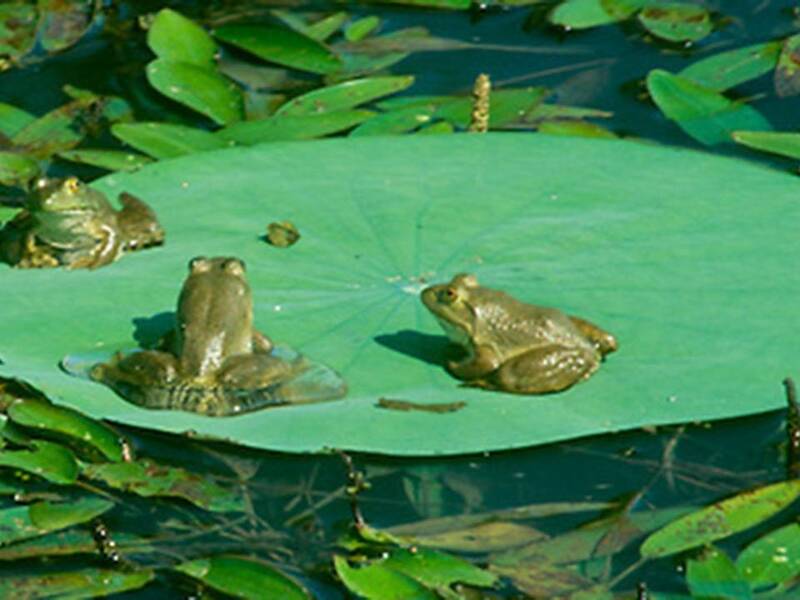 Three frogs were sitting on a lily pad in the middle of a large pond. After some time, all three of them decided to jump. So my question is, how many frogs were left on the lily pad? Three! You see there’s a huge difference between deciding to do something and actually doing it. So today I’ve decided that I’m going to challenge you to do something. I’ll let you think about it for a while, but ultimately you’ll need to decide to actually do it…or not. No more just sitting on the lily pad thinking about it for days on end. The time to jump is now. So here’s my challenge. Here’s the question I want each of you to consider today. Are you a follower of Jesus? Are you one of His disciples? Now I’m sure if I asked for a show of hands as to who here was a follower of Jesus, every hand would go up. But I want you to go deeper. Simply being present here in this church today does not automatically make you a disciple. Remember, I said I wanted to challenge you. Let’s consider what it really means to be a follower of Jesus so that you can answer my question honestly. That seems like an easy task right? Yea sure! Did you notice in Paul’s Letter to the Corinthians that the church there was fighting over this very question? There were rivalries forming and wrong teachings about Jesus being passed around which is why St. Paul wrote the letter. It’s as if he’s saying, “Listen up people, you are losing sight of what’s important. We should be united in mind and purpose. 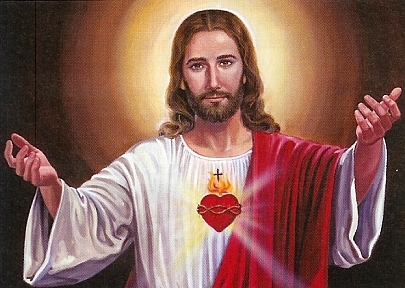 We need to focus on Jesus Christ and stop all this bickering. We need to be true to the teachings of the Son of God!” What does this look like 2000 years later? 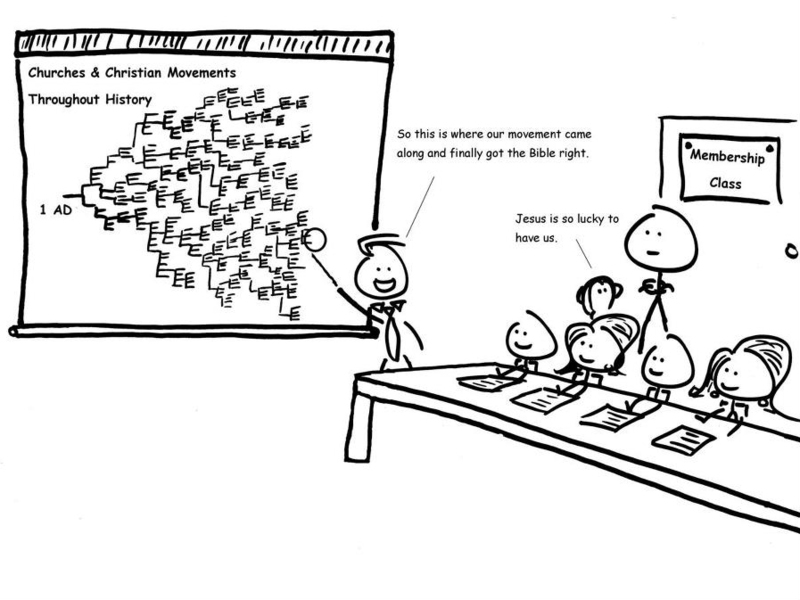 According to a December 2011 report from the Center for the Study of Global Christianity, there are upwards of 41,000 different Christian denominations worldwide. Apparently Jesus’ followers still have trouble agreeing. So I ask you again, what does it mean to be a follower of Jesus? Does it take wealth, fame or success in life? Hardly! 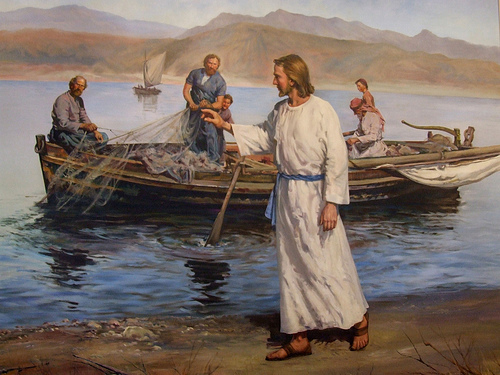 The very first followers Jesus invited on His journey according to Matthew were fisherman. In the ancient world, fishermen were typically not part of the elite crowd. They were hardworking people who were not afraid to get their hands dirty. Peter, Andrew, James and John were ordinary men, who were given an extraordinary challenge from a humble teacher. They were asked to leave their steady jobs, leave their families, and become “fishers of men.” Honestly, these men probably didn’t fully understand what this phrase meant, but still they dropped their nets and followed immediately without hesitation. Now roughly 1/3 of the 7 billion people on this planet call themselves Christian and it all started with a few fishermen dropping their nets to answer a call. What safety nets are you still clinging onto? What is preventing you from following Christ without hesitation? In the Responsorial Psalm today we proclaimed, “The Lord is my light and my salvation.” But do we really mean it? 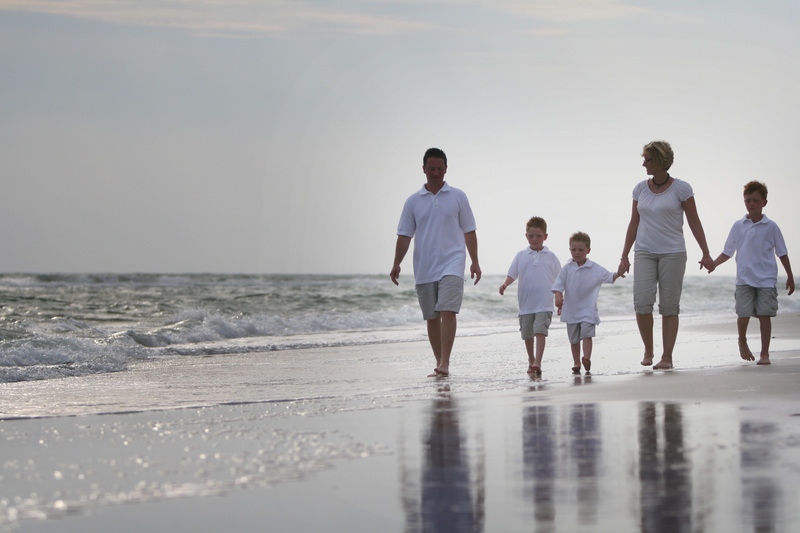 Do our day-to-day actions reflect our Christian beliefs? This really hit home for me when I was ordained a deacon in 2012. During the ordination rite, Bishop Gainer handed me the Book of Gospels and said, “Receive the Gospel of Christ, whose herald you have become. Believe what you read, teach what you believe, and practice what you teach.” What are your actions teaching others? One of the great marks and curses of our faith is that Jesus doesn’t force anything on us. He allows us to freely choose what we want to do in life whether it’s good or harmful for us. He laid out His teachings for us to wrestle with and now is waiting to see what you choose. Obviously He’s hoping you will choose Him, but loves you enough to not force Himself upon you. After all, forced love is not true love. True love is doing what is right even when that means you may suffer for it. Being a disciple of Christ means being willing to lay down your life, figuratively and literally, as an act of love for Him. This is the invitation that Jesus gives all of us with the first words of His public ministry, “Repent for the kingdom of heaven is at hand.” Repent simply means, “to turn.” Turn from what? Sin. He’s telling us to stop leading a life dedicated to “me” and start leading a life dedicated to “God.” Jesus opened the Kingdom of heaven for us. 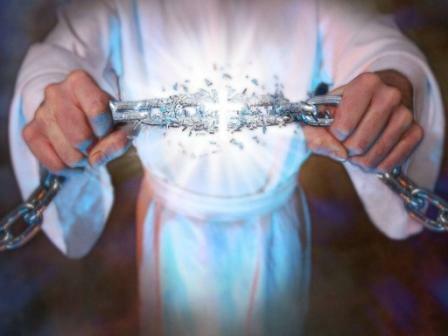 He is the key that unlocked the gates to everlasting life with His Father. He is the great light prophesied by Isaiah. God sent His only Son to earth out of love. Jesus’ appearance on earth was to be a wake up call for us, but are we listening? Learn your faith. Live you faith. Jesus is asking you to be His disciple. What’s your response??? On April 26, 2006 Aron Ralston was hiking in the Blue John Canyon in Utah. He was an avid outdoorsman and was hiking down a slot canyon by himself. These are known to narrow, but very deep. In this particular canyon there was a suspended boulder lodged between the walls, which was blocking his way. He decided to climb down deeper and go below it. Unfortunately as he was climbing down, the 800lb boulder somehow came loose, rolled back and pinned his right arm against the canyon wall. He was trapped down in a deep canyon, with little food or water and he never told his family or friends that he went on this hike. 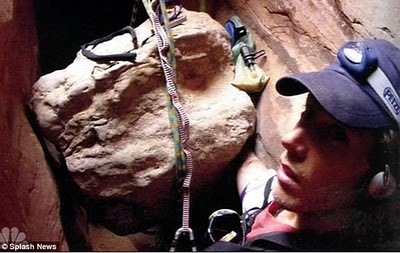 Aron Ralston was able to take a photo of himself while trapped in the canyon. I think this story, which may seem gruesome at first, is actually very inspiring. It can teach us a lot especially when viewed in light of today’s Gospel parable from Luke. Lazarus spent his time on earth with no money and hardly any food. His body was covered in sores so he obviously was in poor health. He was the poorest of the poor. 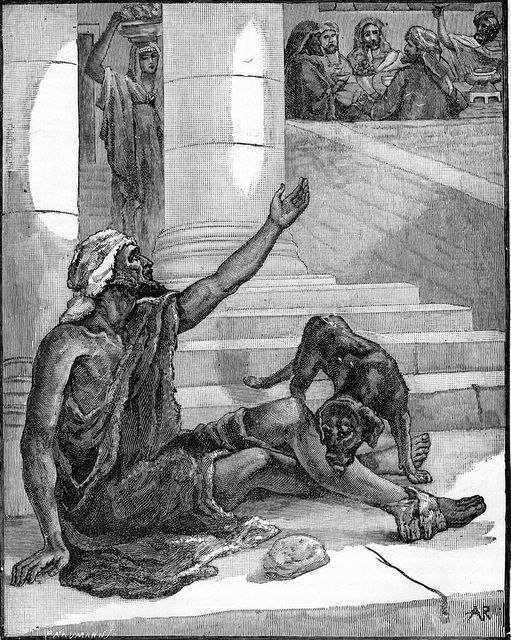 Lazarus spent his final days lying at the door of a very wealthy man hoping that this man would give him a scrap of food. Perhaps the rich man was too busy to intervene, didn’t want to get his hands dirty or just didn’t want to waste his time with a poor beggar. So, with no charity shown to him, Lazarus died. But what he lacked in earthly wealth, God more than made up for in Heaven. His lack of attachment to material things allowed him to let go of this world as the angels carried him up to God and Abraham in heaven. In an ironic twist, the wealthy man who ignored everyone else but his own needs also died. All of his wealth, all of his attachments to this world could not keep him out of the fiery pits of hell in the afterlife. What happens next should be a wake up call to all of us. There is a definite separation between heaven and hell that can’t be crossed. Once you enter one, you are not permitted to venture to the other. Not even Lazarus in heaven is permitted to give a drop of water to the rich man in hell. Even more daunting is that Abraham denies the request of the rich man to warn his sinful brothers, who are still alive, to repent. Abraham’s reason is that those sinful people have everything they need to make good moral decisions, but still choose to do wrong. 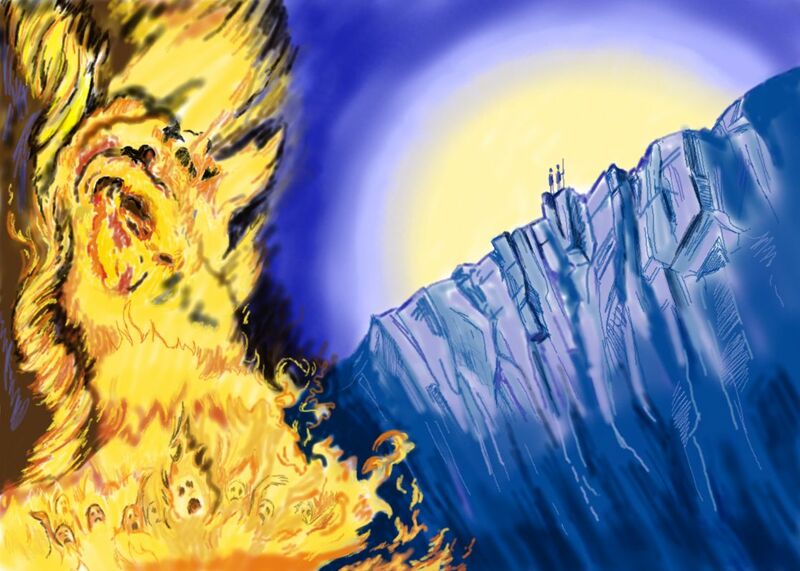 They still insist to separate themselves from God and cling to their own ways, which will ultimately lead them to the same fiery pit as the rich man. Why do I say this is a wake up call? Because you never know when today or tomorrow will be your last day. You never know when that sin you insist to cling onto will be the very thing that sinks you deeper and deeper into the chasm of hell on your judgment day. Some may be out there thinking, “Oh come on. I am a decent person. It’s not like I burnt down a church or murdered someone.” It’s funny how we default to that mentality when we try to justify our own shortcomings. I’m pretty sure on our judgment day God isn’t going to ask you, “So…what did you NOT do?” “Well I’m glad you asked. I didn’t burn down a church or join a gang.” No, God is going to ask you, “What did you do for me? What did you do to the least of my people? What did you do with the gifts I entrusted to you?” As the rich man shows us in this parable, “seeking happiness in material things is a sure way of being unhappy” (Pope Francis, Twitter, Sept 15). We need to identify what things are pinning us down and separating us from God right now. Sometimes we may even get so involved with the wrong things that we become delirious and don’t even realize what we’re doing is harming our souls. That is why prayerfully examining our daily lives and regularly going to the sacrament of reconciliation can be so very powerful. This is how we identify what things we need to cut out of our lives. Sometimes this can hurt. Talk to someone who went through alcohol or drug rehab and they will tell you of the pain they went through to cut out their sin. But here’s the glory of it all; the thing that makes it so beautiful in the end. If you are willing and able to deal with your sin now…if you are willing to help others instead of only focusing on yourself…you too can experience the glory of heaven after death. But waiting to start tomorrow may be too late. Remember Aron’s quote from earlier? “I smiled as I cut my arm off. I was grateful to be free.” Ask God to help you identify your sins right now. Ask God to give you the strength to cut them off right now. Ask God to show you how you can help others right now. Jesus loves you! Allow him to set you free. Allow him to raise you out of the chasm of sin. And as you are going through the pain of cutting off your sins…as you are going through the pain of letting go of your ways and following God’s ways…smile and be grateful that you are being set free in Christ.